What does Reading Apprenticeship have to do with Science and Math Learning? Reading is problem solving, but not all disciplines concern themselves with the same problems or problem solve in the same ways–and this understanding is at the heart of the Reading Apprenticeship framework. 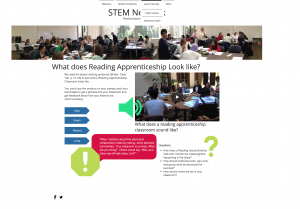 STEM instructors have been relieved and refreshed to learn that Reading Apprenticeship is not a “one-size-fits-all” product that will supposedly “fix” our students or our instruction. Rather, it is a framework for inquiry designed to help all of us remember the discipline-specific habits of mind that are crucial to learning and understanding our subject matter, but that have become automated for us after years of developing our expertise. Focusing on metacognition can help both us and our students understand discipline-specific ways of reading, writing, thinking. 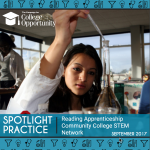 The Reading Apprenticeship STEM Network (first supported by a grant to WestEd’s Strategic Literacy Initiative from the Helmsley Charitable Trust, now supported by 3CSN) has been a productive space for STEM educators to figure out how to create active learning scenarios where the students are TRULY learning actively, and the time is truly well spent! The Campaign for College Opportunity has recently spotlighted the STEM Network in its “Demonstrated Excellence” Series. Read the article HERE!